the flights went well we arrive today around 12:30 safe and sound. we are fighting off the jet lag and going to bed at our normal times. thanks for praying us home safe. We're on a brand new a320 air new Zealand. It's a very nice plane. Each seat has a tv screen large nearly double the size of the ones we've seen before. It's a touch screen! It also comes equipped with a USB slot to charge your equipment or to view your media on the screen. Anyway very nice plane with very nice amenities. I especially like the heartier seats that don't bump around much. Oh and thanks to Sydney somehow causing hers to reboot I've learned they all run on Linux. Three weeks ago something occurred that pained my heart. 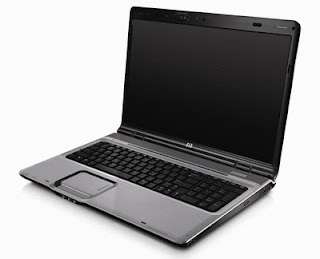 3 laptops were stolen from national translators who work with an organization close to us. In PNG, not a half mile from where we sleep, at night some thieves came in and stole the laptops from the national men and women here to do translation work. As a result they lost a year's worth of translation data. That's more than 4 books they were working on revising. This pained me greatly given that I've done a lot of work in this country to avoid data loss. Sadly they are not a part of our organization and did not have the resources or the training to get backups, even though at times we've consulted with them... this particular group hadn't been trained. Again, not our organization a different one, but that only slightly lessens the blow. So we began praying... that somehow the data would be recovered and the work they had done over the past year would not be lost. Today about 2 hours before I get on a plane to the U.S. I got an email. 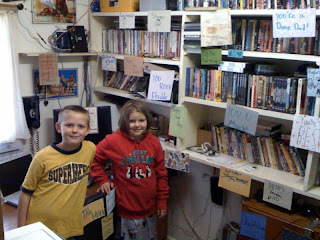 > the Lord has provided new computers for our translation needs." > ALL lost, has been miraculously preserved and recovered. All of it! > IS NO ONE LIKE JEHOVAH! > Thanks so much for praying!!!! In related theft, a course called VITAL which teaches translation to nationals lost over 12 laptops in a theft last week. No one was threatened as the theft took place over night... but their work was gone. Thankfully a device CTS was instrumental in putting in place was available for backups and no data was lost! a laptop and projector was stolen from the AIDS education team as well in the last month. If you have a heart to, please pray against laptop theft. Laptops are being stolen frequently. 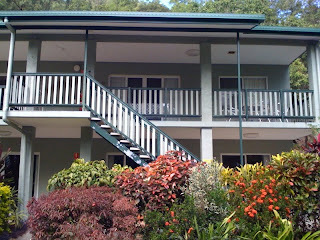 This is where we are spending our 1.5 day layover in Cairns, Australia. I'm a relative baby in the world of missions. Everything is so new to me, the thought so often foreign. Yes after being immersed in it for nearly 4.5 years now (including training) the thinking is less foreign then it once was, but I'm still constantly surprised by 'firsts'. For example this is our first furlough. But I am flabbergasted, and I don't get that way often. 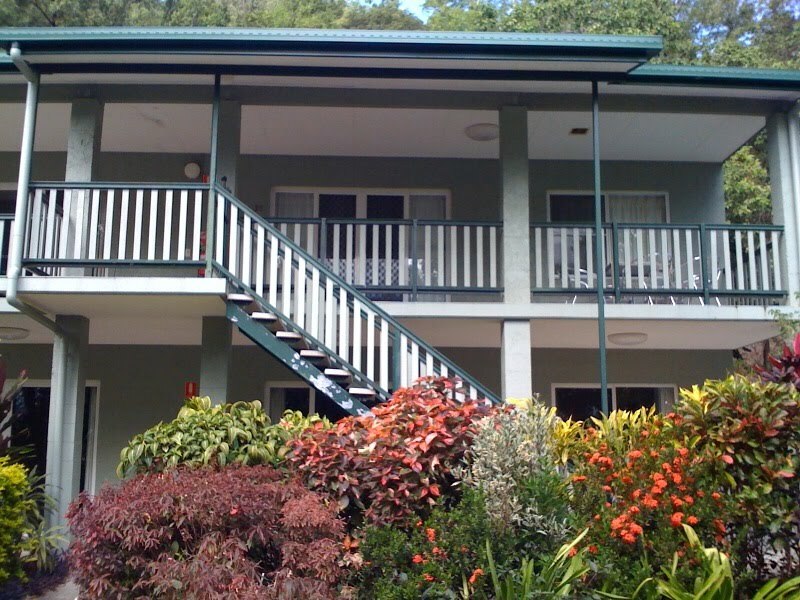 Treetops is a joint mission effort to create a place to stay for traveling missionaries, or missionaries who need a place to stay near the hospital for having babies, medical processes. etc. For example some friends of ours last year wound up needing months of rehabilitation after an accident, where could they stay affordably? Treetops. Okay... so maybe for you it's not hard to imagine people raising their own support to go to work at a 'hotel' for missionaries. Maybe then you'd imagine a dilapidated facility. Not at all, this place is a haven. It's gorgeous and well kept. The paint is fresh, the road is covered in gorgeous brick pavers... to get an equivalent room like this in the non-missions world you'd be paying about $200 p/night easily. and that's U.S. rates not AUD which would be higher. But what are we paying? More like $30.00 p/night! How? Why? Because people recognized a need and God put it on their hearts to fulfill that need. But even all of THAT isn't why I'm flabbergasted. a place out to make a difference is tangible. or the requirement that if you stay here more than a week you need to contribute to the work (well the dad's do while the mom's watch the kids.. or vice versa)... to keep expenses down. Still.. not why I'm flabbergasted. This is what astounds me most of all. We've been in horrid places, we've been in nice-for-a-3rd-world-country places. This place is plain nice even if you've never stayed in a 3rd world country. Being a support worker, our vision and aim is to support the work of Bible translation through the talents we have.... and often we don't feel necessarily on the front front lines. Yes were in the field, but we support translators who are in the village in the field. Now take that and imagine you're still in your home country but doing support. This is what flabbergasts me. That people can serve such a great function and still be in their home country and still raise support and still have the resolve to not get discouraged and do not only their work, but to do it with such excellent quality that it becomes a wonderful ministry to everyone around them! I LOVE this world of missions.. I love the mentality that things aren't cold and impersonal but that it's one large world-wide country, each serving each other... man this is got to be a small glimpse of what heaven is like... such humility of service. To explain a tad further... it is very hard to raise support and NOT go overseas. Yet hundreds of people do this yearly. It's harder for them because missions means to many people 'go over seas and build stuff'. Missions is very simply by my definition, the faith commitment to serve God with the talents you have, wherever He asks you to go. It could be staying in your house. It's hard to communicate that... especially if you're trying to raise funding. I imagine for these people they must struggle with 'well I could go get a job at a public motel, and do the same work and get paid for it and not have to raise support'. But they don't... and people like us, benefit from it. Missions takes many types.... and this is why I am flabbergasted. and He accomplishes His work, ALL the while creating this huge fabric of relationships based on love, service and humility. Being a part of that fabric is you and I, and that... astounds me. Almost daily it astounds me, but today seeing the fruition of one such mission.. this place they call treetops which has so often been a boon... a safe haven for missionaries in dire straights, I am amazed by God's complexity and provision. WOW internet is FREE here and SOO FAST! I can upload these blog photos super quickly. I forgot just how fast non satellite based internet could be. As far as culture shock.... not much yet. We did go grocery shopping for some breakfast items and although we're used to Australian food perhaps you would find some of these photos interesting. My wife wouldn't let me experiment, but I'm pretty sure the slots on the wheels of the cart match the slots on this people mover... the grocery store was on the second story of a mall... we parked in a huge parking garage. this kids went nuts over this kia caravan car we rented (for $2.00 p/hour!!!!!) and also we noticed how more affordable groceries were. People have often talked about how all the huge amount of choices have stymied them with culture shock, but we didn't notice it. I did however notice it took a lot longer to make a decision as to which cereal to get for the kids... since we eat Aussie food mostly in PNG, it wasn't because they didn't know the brands, it was because there were so many choices. but when you go away and come back, it's all new again and so the asking starts over again. All the conditioning is gone. They were dazzled by things they would have overlooked before, and we often had to call them away from the kid-trap machines. We're rather relaxed at this point, confident that everything is done, and well done and double checked. there are two popular ways to do the 'pack and go' thing for home assignment. 1 - life is very busy, cram in all the packing the last few nights. 2 - do a little bit each day so that you aren't stressed and then spend your final day relaxing waiting for the plane. We did 2, some do 1, to each his own. So here we sit in this nice little guest house, our own house all packed up and locked up. 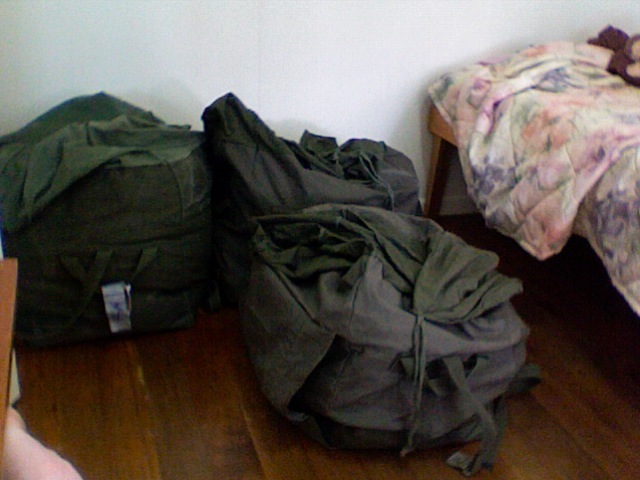 Our luggage is 4 German Army duffle bags. These bags were the cheapest luggage we could find that would handle the trip well and still meet all the size requirements. Also they are REALLY secure with 3 hefty straps and 2 cover flaps. One day if we can afford the more pricey action packers... we will. So our plane leaves tomorrow at 10:30. We head to the airstrip at 8:30am. We will spend 2 nights in Cairns awaiting our next flight. Then we will fly 4 hours to Auckland, New Zealand. We will wait 1.5 hours after that. while we were waiting around, Calvin and I was playing a game called 'angry birds'. Calvin: 'Dad why is that bird frowning? birds can't frown?" Dad: 'Son, for that matter why is the bird exploding itself? Don't search for meaning in the midst of nonsense." I laughed so hard at that one... he didn't appreciate the irony, but I did. It’s been nearly a year, but my co-worker and friend is back! We met them at the plane and helped them settle today into their new house! I was very excited to see him get off the plane, now I have no guilt for leaving the centre because it’ll be in good hands, and I have no fear that my work and my servers/network will fall apart because I’ve worked with Richard and know he’s good at his job. Ah... To be able to get on the plane and head home without the worry of leaving people unsupported is a HUGE relief off of my shoulders! Thanks be to God for answering prayers!!!! so huge that it startled me as I went in. I also got biscuits n gravy !! started scrubbing the floor together. Boy was she excited. Well today is my last official day of work. PRAISE GOD that my co-worker is coming on schedule. I'll be popping in to work to keep an eye on things and make sure they run smoothly.... but I won't be holding regular office hours. WE get 2 weeks to pack up all our earthly belongings, prepare our house for renters (pray that we get some), and get on a plane. I'll be spending 90% of that time packing but we're so well organized it won't be stressful. The other 10% I'll be unofficially working and keeping things going until my replacement arrives. (PLEASE Lord let him arrive on time and healthy). Kendal's last day WAS going to be Tuesday but the school lost a few teachers suddenly, so school ends today. It was a bit of a hurry up, but we got it done. On June 30th we'll be back in the USA... we'll be going to a camping trip with family, then Kendal and Syd will go to visit friends and their church for a week, and then after that the kids attend a summer camp!! So through August we have a busy schedule... which we're hoping to fill up with reunions with you all! One of the things we do here on the side is a weekly Bible study. I've been leading a study of I Samuel for some months now, and have only last night finished it. The study is over. We're winding up a great many things now. We want to return in January for a second term. -pray that things go well here while I'm gone and that the equipment remains functional. thank you again for your prayers! today we got down and dirty... literally. about a half mile of fibre optic cable to pull. And it went very well. It was well planned (by my new manager). It is nice knowing I have 3 days left and something I've wanted to accomplish for a long time has been done. Now we can offer network to a portion of our campus that has been forever offline. I had this image in my head, and this is my poor representation of it given that I'm not very good at photoshop. I wanted to communicate a few things with this image. The people at the top are all the missionaries here in PNG. The person standing on the pillars represents my family. As support staff we free up translators to do Bible translation while supplying for them services and help that they would otherwise have to do on their own. If we as support staff are unable to do our job, then the translators are unable to do their job. Notice in this picture the people up top are holding hands? If I can't fix computers and provide email, telephones, internet access, file storage... then EVERYONE ELSE is affected and can't do their jobs as well if at all. If we fall, they fall. 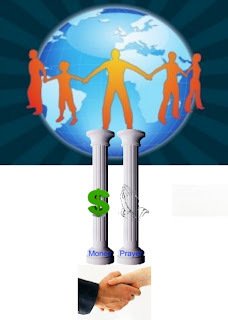 The pillars represent financial support and prayer support. Underneath the pillars are shaking hands, representing partners. YOU are are partners. We don't call you 'financial support' or 'prayer support' even though that is what you do. You are more than that, you are partners with us in this ministry. If our financial support went away, we'd fall and thus the entire ministries here would be affected. If our prayer support went away, we'd fall, and the same would occur. If they went imbalanced, we'd have to do a lot of work to maintain our ministry... we'd have to adjust in unhealthy ways. If they decreased significantly, then the others would have to hold more weight. That's assuming they would be able gain the skill sets we have. Many translators have said they would be unable to do their work without our help, and that means without YOUR help. You uphold us, we uphold many. Our jobs are such that we support many families here. Should we go away, there would be large holes left behind. We've spend the last 3 years carving out a huge niche and filling needs. We do not mean to say that God NEEDS us. No.... but God uses us. God uses you and us together to accomplish a great work that will glorify Him! I like this image because it shows the delicate balance of support. How you support us, we support Bible translation. We support Bible translation because it changes lives, it changes cultures, it changes countries. The Word of God transforms. I wanted to take a moment to show you.... what others have said about our jobs. Not as a form of bragging but as a way to share some of the encouragement we've received over the last 3 years. Think we might have just gotten one of these... and because I read your note I was suspicious :). Your ministry in this way has saved us lots of time getting uncorrupted. THINK I can take it from here. Blessings on you. The network support guys apparently had our DSL activated in the Lewis house before we even arrived. It worked as soon as I plugged in the router. So today I want to say, 'well done' to CTS for helping us get our communications going immediately. Thanks so much for all of your help with this. Their promise of within 15 business days was the "outside" chance - and I just received the number today, so was able to get the license renewal into the hands of someone flying to the US who can mail it this week. Would never have happened without your hard work and without your very willing friend. Please pass my extreme thanks on to them as well. And thanks for all you do to keep us up and running - not an easy job with hours that almost rival those of the clinic docs (sometimes more), so thanks. Well after all your patience and perseverance talking me through the procedure of getting the e-mail working it has paid off! The office and my personal computer are sending and receiving. I just haven't got around to changing the team one yet, anyway they are all connecting individually on their own computers. Thank you very much for the time you spent on the phone with me this morning. I was much appreciated! Hope you can get out to Kavieng sometime. afternoon, I can tell that you are passionate about the subject! We just want to say a HUGE thank you to everyone who helped get it going again. (Tuesday) at noon, we were able to make a good connection again. We know that you all have many things going on. Thank you for what you do to keep this system running. It is a great blessing and help to us out here in the village! Please pass this message along to all those involved in fixing the HF e-mail. Thanks for fixing that! It has been a real blessing for me to be able to get email while in the village. There are "some things going on" with our daughter that I really need to keep up with, so your work has been a life saver (for me). I hope you realize how important your work with village email is to the translation teams. I am sure each team has similar stories!